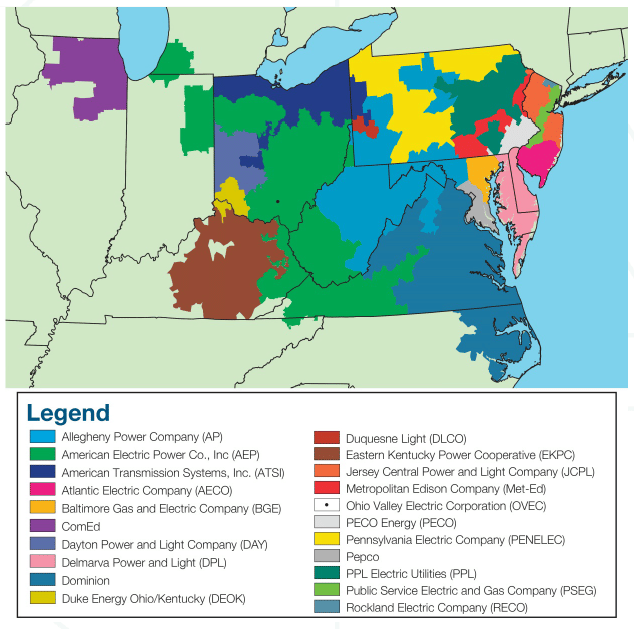 Natural gas accounted for nearly 31 percent of power generation in PJM Interconnection LLC’s footprint in 2018, surpassing coal’s share of about 29 percent, according to a March 18 report from the grid operator’s market monitor. Nuclear power dominated the region’s generating sector representing about 34 percent of the generation mix last year. Renewables had a relatively smaller share, with wind at 2.6 percent, hydro at 2.3 percent, and solar 0.3 percent. The share of natural gas rose by over 18.4 percent between 2017 and 2018, while that of coal fell by 6.6 percent over the same period. Nuclear dropped by merely 0.5 percent over that period. The market monitor identified 24 coal-fired units and three nuclear units at risk of retirement, with a total combined at-risk capacity of 14,954 megawatts. Overall generation across PJM’s market rose by 3.6 percent to 837,648 gigawatt-hours in 2018 from about 808,230 in 2017. The grid operator serves 13 states in the Midwest, Mid-Atlantic and South as well as the District of Columbia.